A hotel restaurant with gastropub inclinations in downtown Seattle. 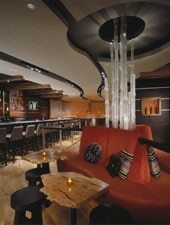 : BOKA Kitchen + Bar, located in Hotel 1000, has a sleek interior, complete with digitally controlled lighting that changes colors. But the cooking is actually well-informed by comfort food classics and the menu is apropos for business lunches, gal-pal dinners and pre- or post-theater pit stops. Hand-crafted cocktails and wines by the glass pair nicely with small or large plates. Consider sharing the Dungeness crab cakes topped with a celery root and apple salad or enjoy the crispy grits with a rustic tomato sauce. BOKA, which is an acronym for "Bold, Original Kitchen Artistry," also serves entrées such as a burger with Beecher’s Jack cheese and braised brisket with Brussels sprouts. A full bar ensures there is something for everyone to drink. Pumpkin sponge cake and chocolate mousse makes a sweet finish.